But pick up any old harmonica and you're promptly expected to benefit from every minute of its evolution. You must hit and bend single ♪s and sound great straight from the box; people will slam your playing if you can't. That's just not fair! What you need is a new kind of harmonica—one with a use. 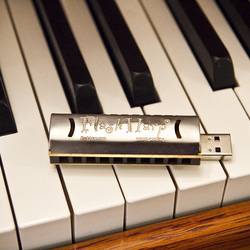 The FlashHarp® Harmonica USB frees you from the baggage of the harmonica's hard-earned status, and from your own performance anxiety. So now you can dismiss all the critics with an offhanded, “What do you expect? It's just a flash drive!" In the meantime, FlashHarp lets you play from a more relaxed center, as you achieve the first real keys to mastery: To NOT put it away. To CONTINUE playing and loving every ♪! I craft each one by hand in a National Historic Landmark* that was built six years after the harmonica first hit U.S. soil. "A mouth organ is a man's best friend, Peekay. You can slip it in your pocket and when you're sad it will make you happy. When you're happy it can make you want to dance. If you have a mouth organ in your pocket you'll never starve for company or a good meal. You should try it, it's a certain cure for loneliness." If you have an outdoorsy hankering or inner wolf howl—or know someone who does—buy a FlashHarp! I'm happy to answer any questions! Just blow me a note. For example: "Can I blow my FlashHarp while the device is plugged into my computer?" Answer: "Not recommended. Besides, why would you want to? FlashHarp has no mic for audio-recording. True, its 'flash' memory 'stores' data but that data first must be in a digital form. Take my lesson; it was video-recorded with a digital camera and microphone so it's already in a form that can be stored on flash memory. Lots of things are digitized that way nowadays—video, audio, text documents, photographs, etc. These 'digital' types of files can be stored and if one wishes, transferred, from one device to another on a flash drive such as the FlashHarp." Many of the world's best harp players "Like" the BackyardBrand Page at: http://www.Facebook/BackyardBrand (I won't drop names but check it out—they're all there). Backyard Brand and FlashHarp are registered trademarks of FlashHarp Music LLC, which vigorously enforces its intellectual property rights.